where the wild things are. ramp and nettle butter. Looking back at my ramp posts from last year, I realized that I never posted a recipe for nettle and ramp butter. I posted the photos but not the recipe. Since the season is in full swing I thought I would share my recipe with you. I know some of you are probably so sick of ramp but I love it. Ramp has such a fleeting season. Every year I find there is more I wish I had done with it than the year before but I seem to feel that way about all the fleeting veg, wild or otherwise. 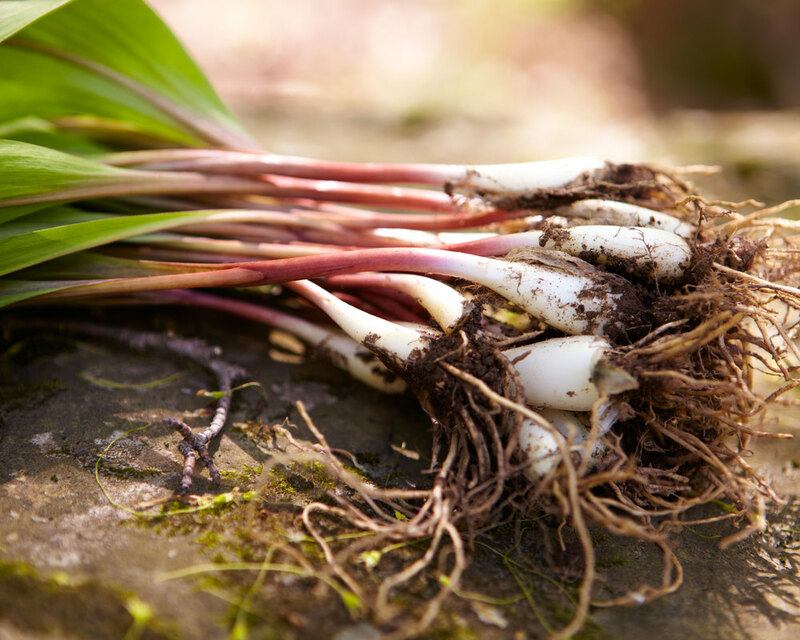 I noticed at the farmers market this past week that some of the farmers selling ramps were offering up some ramp butter. Most of the ramp butter at the market was a compound butter, which is a mixture of butter and added ingredients, like ramps, herbs or lemon. You may have had maître d’hotel butter on your steak frites? This is a compound butter. The ramp butter I have been making is essentially a compound butter but I make it in a different way and it is a lot stronger than the ramp butter at the market. It is more complex and deep. If you want to take the fast route, you can make a compound butter by adding chopped herbs or ramps to a stick of room temperature butter. You will want to mash the ingredients into the butter and fully incorporate them into the butter almost folding it over on itself again and again with a paddle or a wooden spoon. Here is a nice tutorial on making compound butter from Serious Eats. I make my ramp butter by whipping up fresh cream in the food processor along with chopped ramps or nettles and herbs, depending on what kind I am making. I mix the cream and herbs at a high speed in my food processor until the butter starts to separate from the buttermilk. In a bout a minute’s time they will have formed a soft whipped cream cheese like spread. You could stop there if you would like and use it like a whipped butter but without separating the liquids from the butterfat it will not keep as long. I prefer to take it all the way to butter. I pulse the cream and herbs until there are two bands visible through the sides of the processor. One will be a vibrant green liquid and the other will be the paler heavier fat of the butter as it separates. I keep pulsing the processor until the butter starts to slap the sides of the food processor. The butter will appear grainy and clumpy at this stage and it will be sitting in a pool of liquid. This liquid is technically the buttermilk, but it is not like the commercial buttermilk that you buy in the store. It is much thinner. Commercial buttermilk is generally cultured and thicker. You will want to drain off the liquid. If you are feeling adventurous you can reserve it for a later use. I made ramp buttermilk biscuits with mine. Scrape all the butter into a large piece of cheesecloth and give it good twist. The buttermilk will spurt out onto the bowl below. Drain it off into your buttermilk reserve. You will know you have drained most of the buttermilk once the butter starts to come through the cheesecloth. At this point stop and proceed to the ice bath. Take a large mixing bowl and fill it with ice cubes and cold water. Spoon the butter into the ice water and gently scoop it together with your hands until you form a ball. Let it sit in the ice bathe until it firms up for a minute or so. Rinse the butterball under cold water and set it in a shallow bowl. With a wooden paddle or a large wooden spoon start to fold the butter over itself pressing down as you do so. You will be forcing any excess buttermilk out of the butter by this repeated action. You are also "working" the butter. This was essentially what a butter paddle was for. Keep doing this and draining off any excess buttermilk into your reserve. Eventually the butter will be free of all buttermilk and you are ready to store it. You can either form it into a log or wrap it in plastic wrap and parchment to freeze for later use or you can store it in an airtight container in your fridge, I like to use glass. It will keep indefinitely either way. If you freeze a big batch you will have it all year to throw into pastas or on steak. It is so delicious and so very different from the standard ramp butter I have seen floating around. You might have to be careful to not eat it straight! It is that good! I hope you don't find this daunting. It is really very simple and once you do it you will find yourself making all kinds of flavored butters or maybe just fresh spring and summer yellow butter. Add the chopped ramps and the cream and salt together in the food processor. Start your butter on high speed. It will combine to a spread like texture within a minute or so. You can stop here if you want to use it like this. At this point the buttermilk has not yet been separated from the solids. I keep it going for another five minutes or so. You will at some point see the solids separate out from the darker green liquid (ramp buttermilk) in two bands along your processors edge. I keep it going past this point until the butter starts to clump in small chunks and grains along the processors walls. Continue following the instructions above. You can make nettle butter following the same basic instructions with a few exceptions.. Start with a pound of fresh nettles. Use gloves when washing. Remove with a slotted spoon and squeeze the excess water from the nettles until the form a ball of what looks like frozen spinach. The bright weather this past week, though a bit cold, has really making me think spring! Pretty soon the West Village will be flush with blossoming Magnolias and Quince and Cheery blossoms. It is one of my favorite times of the year in New York and always reminds me of home. For me the seasons have always been marked by the comings and goings of botanicals. It is a little harder to notice these changes in New York unless you have a back yard or a country escape. To get your fix, you can visit the Green Market or make time to visit the Botanical Garden, which is just spectacular in the early spring and summer. You can also set out to explore one of New York's beautiful tree lines streets like many in the West Village or Brooklyn. Recently, I needed salted cherry blossoms for a shoot and when the Internet came up empty (you can order them fro Japan but it would have taken too long) I have to admit I had never heard of them! 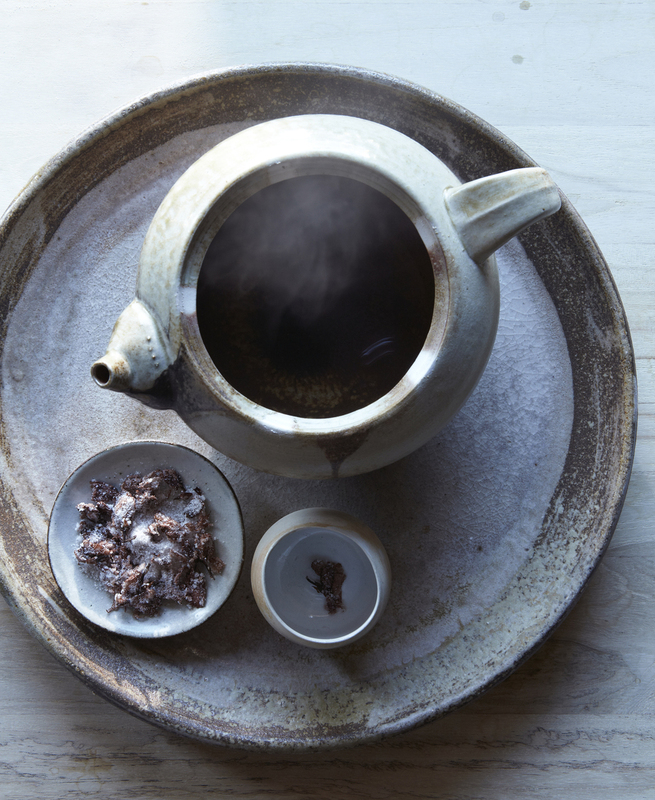 I turned to Heidi Johansen from Bellocq Tea Atelier. I knew that if any one had a stash of salted blossoms it would be her!! Heidi is kind of magical and she produced these mysterious salty pink flowers of nowhere! Now that the season is upon us, I have decided to create my own stash. Sakura tea, or salted cherry blossom tea is often served at weddings or other auspicious events in Japan. It has a delicate salty and sweet flavor. It is fragrant and woody. The saltiness obviously comes from the salt but the sweetness is imparted through the flowers natural flavor and additional soaking in Plum vinegar. 2 cups of fresh cherry blossoms. IF you have a cherry tree in your yard you can pick from there or you may be able to pick up some branches from your local farmers market but be sure to ask if they are natural and pesticide free. You will want to pick them before they are full bloom when they are buds to a little more than half bloom. Wash the blossoms and set on a paper towel or kitchen cloth to dry. Gently pat until all the water is removed from the blossoms. Place in a pickling croc or a shallow terra cotta croc. Place a plate or a lid on top of the flowers. You will want this lid to fit nicely in your vessel. (I used a plate) Then weigh it down with a weight of some sort. I used a river stone. You can buy a fermentation croc or you can use a vessel that you already have and weigh it down with a homemade weight. Leave it in the fridge for two days. The salt and the pressure of the weight will force any liquid from the blossoms. After two days remove them from the fridge and drain off any excess liquid. My blossoms did not express much liquid. After draining any excess liquid. Place the blossoms in a glass bowl and add the Plum vinegar. Cover and Refrigerate for another three days. After three days strain the flowers through a sieve to remove any vinegar. Spread them out on a baking sheet covered in parchment. Sprinkle thoroughly with pickling salt and set on your counter in the sun to dry or outside in a protected spot. Allow drying for two or three days. When the flowers are completely dry they are done. they will discolor a bit. 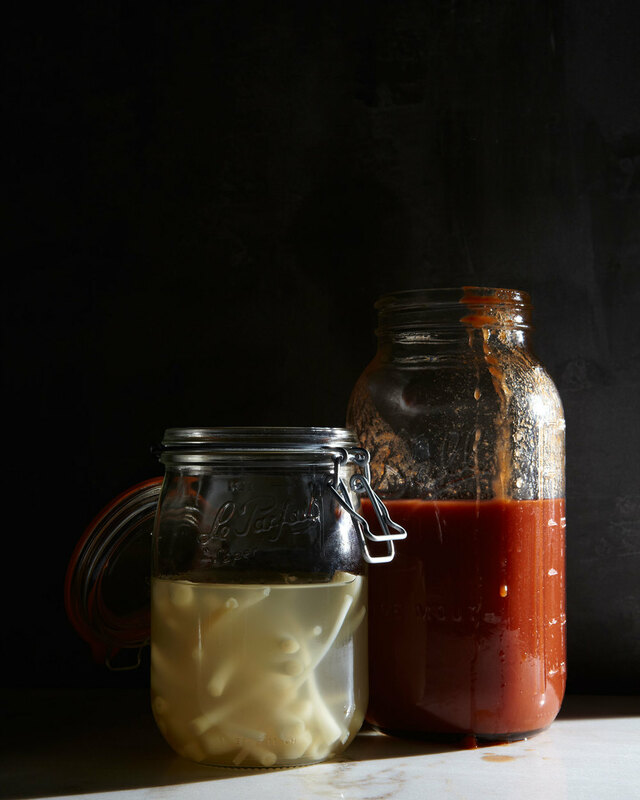 Store in a glass jar and cover tightly. They are preserved will last indefinitely. Finally you can enjoy a cup of Sakura tea! Boil some water and drop three or four petals in your teapot. Don't be shocked! It is salty! It is an acquired taste! Rinse a handful of blossoms to remove excess salt. Add to your rice in a rice cooker or on the stove. The blossoms will impart a lovely pink color to your rice. Here are some more ideas on what to do with salted cherry blossoms. 2 cups rice vinegar¼ cup sugar½ teaspoon kosher salt1-inch piece fresh ginger, smashed1 umeboshi plum (available at Japanese markets or health-food stores)½ teaspoon grenadine syrup8 ounces cherry blossoms, or other edible blossoms. 1. Combine all ingredients except the cherry blossoms in a medium saucepan and bring to a boil over medium heat, stirring to dissolve the sugar. 2. Put the cherry blossoms in a heat-resistant container and pour the just-boiled liquid over them; stir gently to submerge the flowers completely in the liquid. Cool, cover tightly and keep in the refrigerator for at least three days before serving. The pickled blossoms will keep several weeks in the refrigerator. Makes about 1 cup. Chop afew of the blossoms up extra finely and use as a special salt. I am also thinking Salted Cherry Blossom shortbread? Need to experiment with this one. where the wild things are. the blue pearl. 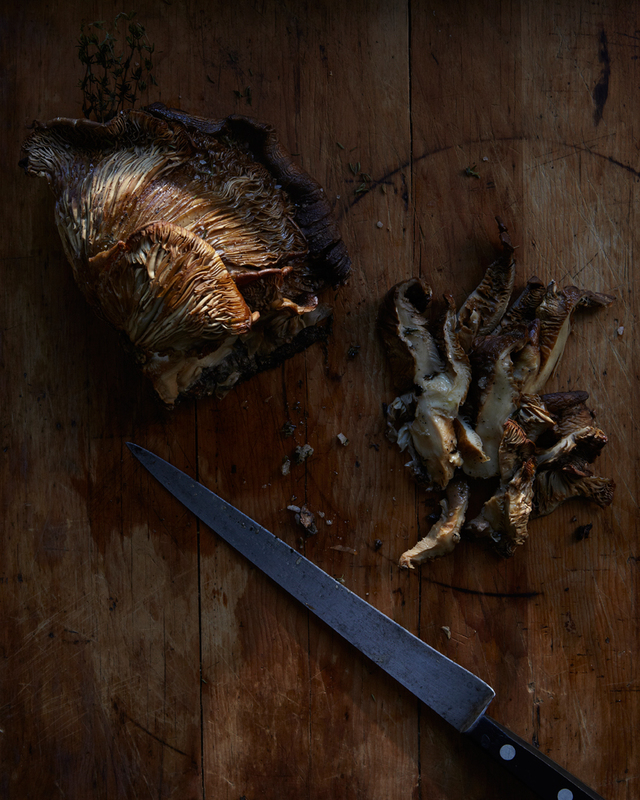 One afternoon, a couple years ago, around a tiny fire outside their farmhouse in Southern Vermont, Les Hook and Nova Kim cooked up some wild mushrooms we had gathered that morning nearby. In a large cast iron pan, they seasoned them with nothing more than a little butter or olive oil and some salt and pepper. It had just begun to snow steadily when we set out to gather. Large fat flakes floated around us amd landed on our eyelashes.Les pulled over in his red Subaru, flashers glowing in the wild flurry of white. He deftly put up a twenty-foot ladder against a slippery maple tree and quickly climbed up. He pulled of the biggest Blue Pearl Oyster Mushrooms I have ever seen off that tree. We drove back to their place and lit the fire. It was then that Nova told us about her non-turkey, perfect for vegetarians on turkey day or for any feast any time of the year for that matter. You must start with a large fan of a mushroom, as you can see from the photo it kind of sweetly resembles a turkey's tail! Though I have roasted many a mushroom from them, it took me two years to get to this post. I asked Nova to save me a large Blue Pearl that I would pick up from the New Amsterdam Market. Luckily my snail mail reached her in time and I was able to get a beauty from them the Saturday before Thanksgiving. I kept in a paper bag on my fire escape until cooking day. Now I know I have sung their praises before but people, if you have not been to the market on a day when they are there then you are SERIOUSLY missing out. If you are interested in finding out when The Vermont Wild Food Gatherer's Guild will be in town go to The New Amsterdam Market website and check the vendor and calendar listings! They always have something special and if you have never been to the market then what are you waiting for? It is every Sunday from 11-4pm. The mushroom I got from Les and Nova was held together by a stretch of bark. I left the piece of bark on the mushroom while I roasted it. I brushed the mushroom with a generous amount of olive oil and sprinkled it with French sea salt cracked black pepper and thyme. I put in my largest Cast iron pan...this was a BIG mushroom 14 inches across at least. I threw it in the oven at 350 degrees for a slow roast and when it started to brown at the edges I put about a 1/4 cup of water in the pan and covered it with tin foil to add a little more moisture. Mushrooms are essentially like sponges so they soak up all that moisture. I may not have needed to do this if I had roasted it right away but since I had waited a few days I thought it might help to add the additional moisture.. I took the tin foil off for the last five minutes or so of cooking. I can't give you a specific cooking time because it depends on how big or small the mushrooms are that you are roasting. So use your intuition. You want it to be moist and almost meaty when you slice it. We loved this so much that we could almost forego the turkey next year and just eat this! Thank you Nova for this brilliant idea! Brush and drizzle with olive oil. Mushrooms really soak it up so be generous with your application. 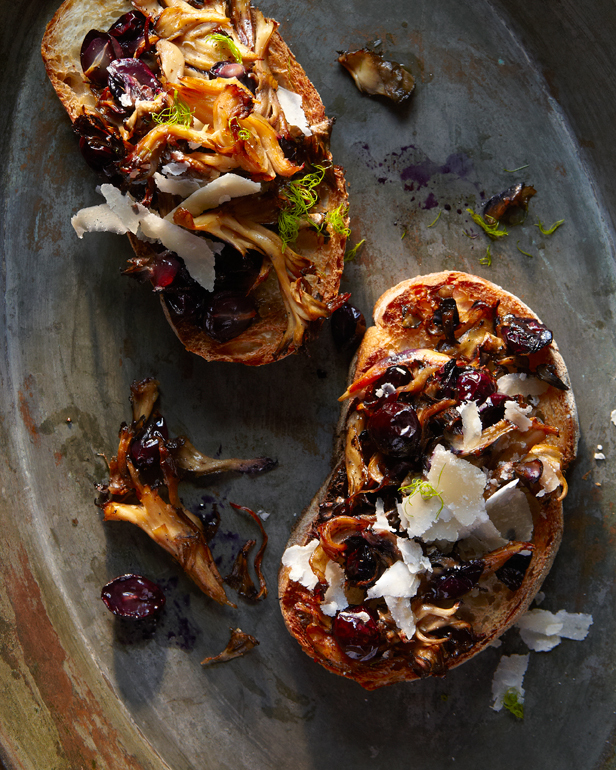 Place in the preheated oven and roast for 15-20 minutes depending on the size of our mushroom. When the water is all evaporated the mushroom will be done. Uncover for the last five minutes or so. The mushroom should be moist and easy to slice along the grain. Cooking time really depends on the mushroom size so keep and eye on it! @ You don’t want it to be too tough!!! As always, a word of caution where wild mushrooms are concerned. Leave the gathering to an expert!! where the wild things are. hello fall. Hello friends. It's been a while and though this is not quite going to be a proper blog post, I am getting there! It is hard to get back into the swing of posting. The last two months have been super busy with work and travel. I am not complaining, as I do love both! As soon I got back to New York, I made a visit to The New Amsterdam Market, one of my favorite city markets. Les and Nova of the Wild Food Gatherers Guild of Vermont, were there with pounds of mushrooms in all shapes, sizes and colors. I couldn't resist. I dried some and plan on making a Chanterelle vodka and a mixed mushroom ragu with the others. Those posts will hopefully be up soon. For the moment, all I have to offer are these lovely wild mushrooms from Les and Nova and some gorgeous walnuts I picked up off the ground in France. Yes, I did smuggle the walnuts back. Bad, I know. I am hoping they will make their way into a french inspired cake very soon!